For the sixth time in the last 20 years, three teams from the same division will win 90 or more games. 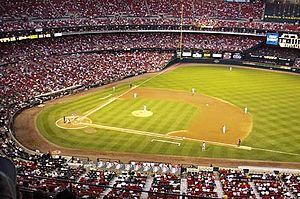 This year the Cardinals, Pirates and Reds, all playing in the National League Central Division, each won 90-plus (through games of 9/27/13, Cardinals had won 95, the Pirates had won 92 and the Reds had won 90). Major League Baseball went to a three-division format in each league in 1994. With three teams in the N.L. Central winning 90 games this season, the N.L. East Division is the only division that has not had three teams win 90-plus in the same year since the three-division format began in ’94. One final note: Of the five previous times when three teams in a division won 90-plus games, none of those teams that won the most games of the three 90-win teams made it to the World Series that year. Ironically, three of the teams that had the second most wins of the 90-win trio made it to the World Series (2002 Angels, 2002 Giants and 2006 Tigers). Could that be good news for the Pirates this season?